Hidden talent revealed at this one-night only event to celebrate Stockton Arts Week! If you know The Vibe Worldwide, you know that we love to showcase local talent and put on amazing events for the community. 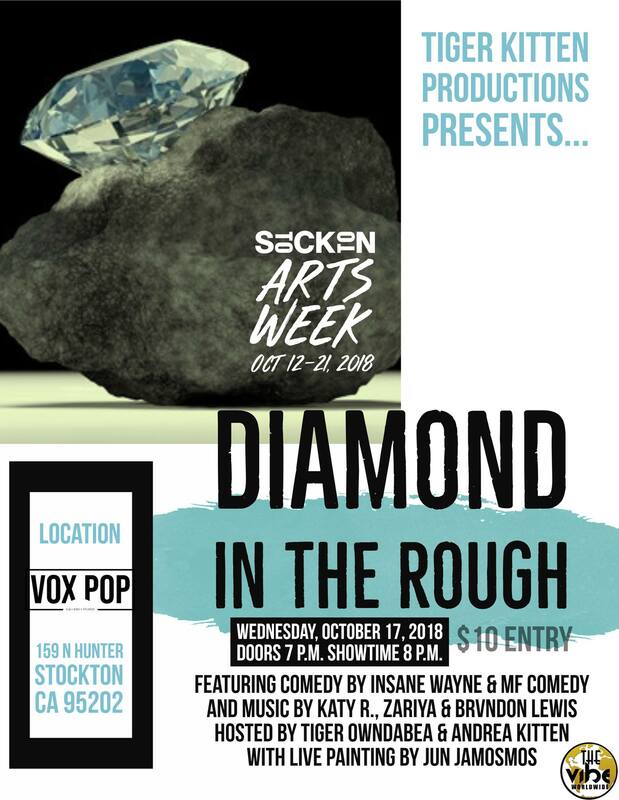 This show is no different and it is part of the Stockton Arts Week festivities! Award-winning Comedian Insane Wayne, Singer/songwriter Katy R., Stand Up Comedian MF Comedy, R&B Singer Brvndon Lewis, & Jazzy Soul Singer Zariya. Hosted by Producer & Hip Hop Artist Tiger Owndabea and Author & Spoken Word Artist Andrea Kitten! Visual arts throughout the building & brief open mic (spaces limited, so get there early). We sometimes hear people say they don’t have anything to do in Stockton, this is the perfect solution to that problem. The Vibe Worldwide is that Diamond in the Rough in Stockton…and these artists are as well. Come celelbrate Stockton Arts Week with us, vibe out, partake in libations, and have a good time! All ages welcome.